I remember days of cleaning up our bedroom when we didn’t bother to pick up pennies. It was easier to just sweep them up with the dirt and throw them in the trash. Does this embarrass me now? You bet it does. I’ve often been intrigued at some of the wealthy folks I know who squabble about the cost of pens and pencils for their office, yet think nothing of blowing a couple hundred bucks on a meal at an expensive restaurant. It makes sense, though. 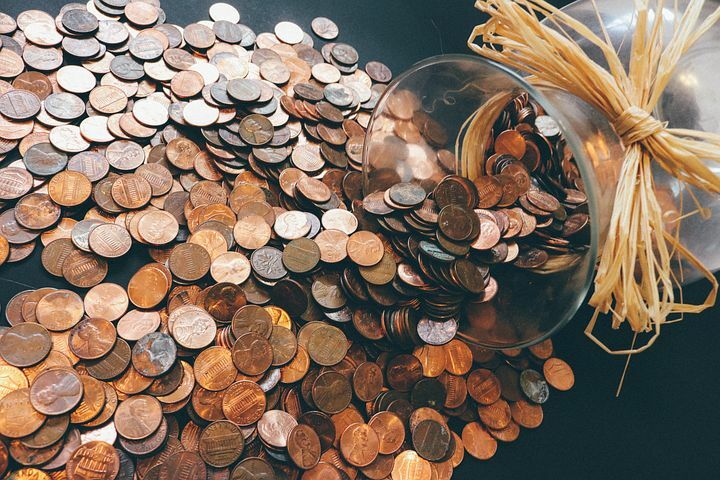 Counting pennies is what accumulates the wealth in the first place. Once you’ve acquired the wealth, it’s yours to spend [tongue in cheek here]. That’s how marriage is. Taking care of the seemingly small things will accumulate health in a marriage and in relationships. Ignoring the small things or trashing them not only decreases the wealth, it also minimizes care and respect. 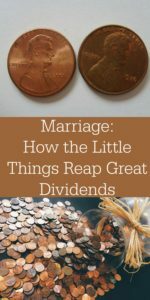 If you check out the marriages that are full of happiness and contentment, you’ll find that these couples have a habit of taking care of the seemingly insignificant and small things. Those small things continue to add dividends over and over; and now they’re enjoying the wealth of a happy and contented marriage. Those small things are the way we keep things tuned and in running condition: oil on a machine, lotion on a baby’s sore bottom, cinnamon in a recipe, and grease to keep gears moving. 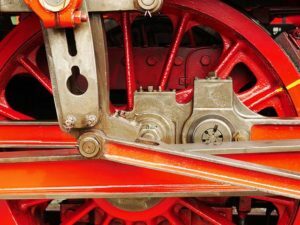 Those small amounts might seem unimportant and insignificant – but they are exactly what keeps a piece of equipment – or a person – moving and working. 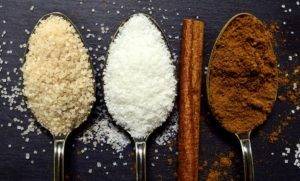 When you’re looking at a large piece of equipment or a freshly-baked cake, the small things like a few drops of oil or a teaspoon of vanilla are not noticeable. Yet the way a machine runs or the flavor of a cake lets us know whether or not it’s been handled and cared for properly. That’s how it is with marriage. The true bounty comes of quiet investments, one penny, one drop of oil at a time. One investment in truth; another in time together; some more pennies in integrity; the oil of respect. 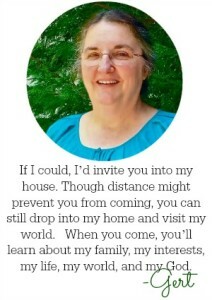 When a couple keeps an eye on those seemingly insignificant things, they will enjoy the reward of rich dividends. If you’re in a marriage that is struggling, don’t look for quick fixes or “get rich quick” schemes that harbor only empty promises. Perhaps you can begin by adding a drop of oil or a dash of vanilla. When a marriage is rusty, there are no quick fixes and no magic formulas. There are, however, things we can do – if for no other reason than to provide healing for ourselves. 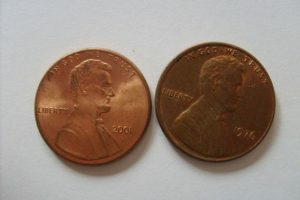 Pick up the one lone penny and save it; add a drop of oil when you don’t feel like it; contribute flavor to life by sharing a dash of cinnamon. If it seems like it won’t help your spouse, know that it will help you. Perhaps as you keep investing, you will find that your penny jar is more full than empty. You will find that peace comes when you’ve done the right thing without expectation of returns.